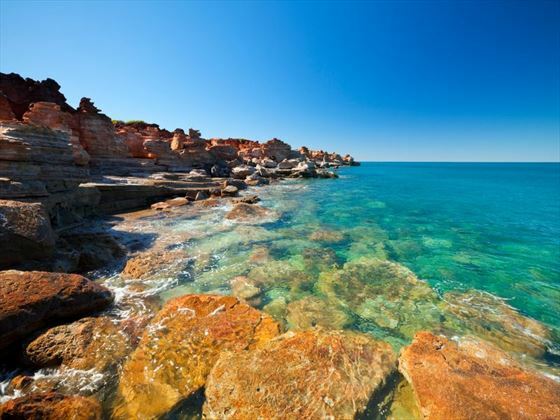 Arrive into Darwin and transfer by private car to your hotel. 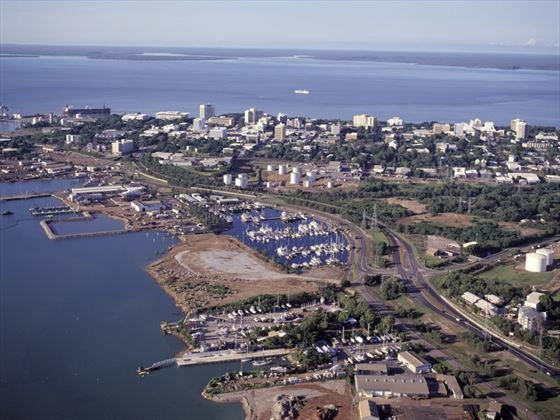 In the afternoon, take a tour of the tropical city of Darwin as you explore the mix of old and new buildings, and visit the Museum and Art Gallery of the Northern Territory, before making your way back to the Crocosaurus Cove for an evening welcome reception and dinner with your fellow travellers whilst overlooking the Darwin waterfront. 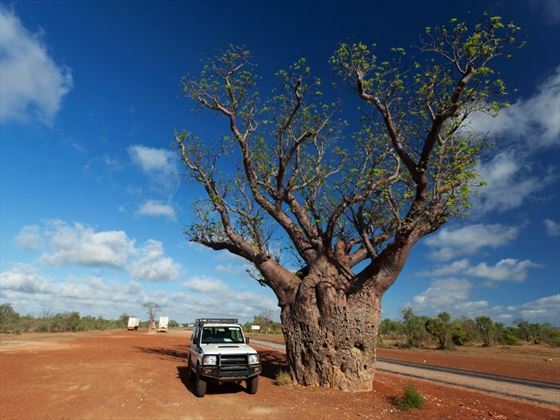 Journey along the Stuart Highway as you make your way south towards Katherine. 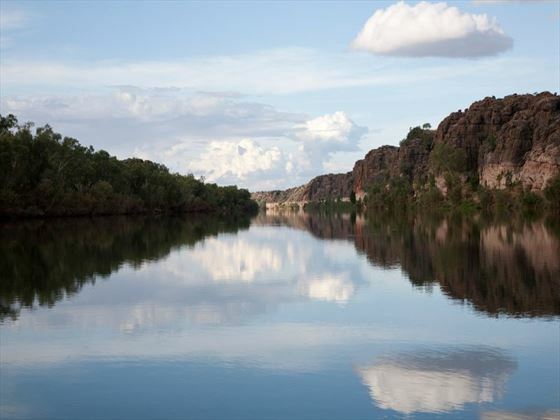 There will be time for a stop at the Adelaide River War Cemetery, dedicated to the WWII air raids on Darwin, before visiting the Nitmiluk National Park to cruise the peaceful waters of the Katherine River in the afternoon. 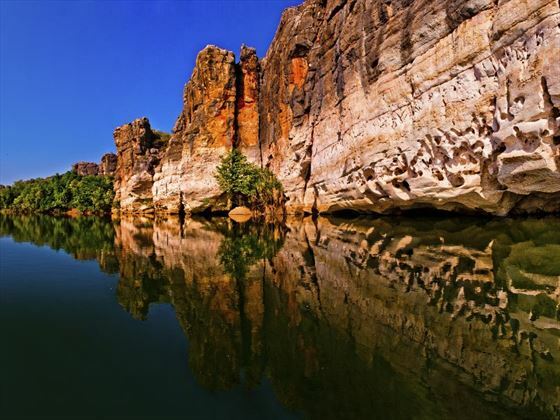 Take a relaxing cruise at Katherine Gorge where you'll feel the spirituality of the land, marvel at the gorges, spot wildlife and learn about the traditional culture and history. You'll later meet Tom Curtain and experience his Outback Show - an experience you will never forget. Today sees you travel via Timber Creek and Victoria River as you pass the expansive cattle stations on your way to Western Australia. Today you will visit the Argyle Downs Homestead which is a historic building that reconstructed to become a pioneer museum. Visit Lake Argyle which is the largest man-made lake in Australia then cruise along the Ord River to Kununurra – be sure to watch out for the many marsupials which live along the lake. Experience a magical sunset on the water before arriving in Kununurra. Take an optional early morning scenic flight over Bungle Bungle beehive domes before a tour of Kununurra which is one of the youngest towns in Western Australia. You’ll see the Ord River Irrigation Scheme and the Hidden Valley National Park, which homes 300 million year old sandstone cliffs and is an astonishing sight. Among the inspiring scenery, you’ll also find a varied display of wildlife, including a variety of birds, reptiles, wallabies and bats. Take in the amazing views from Kelly’s Knob Lookout then make your way to a privately hosted dinner at the Mt Romance Sandalwood Factory. Afterwards, learn about the fascinating industry of sandalwood plantations while dining in the Ord Valley. Visit Hoochery Distillery and meet the makers of the only rum produced in WA! 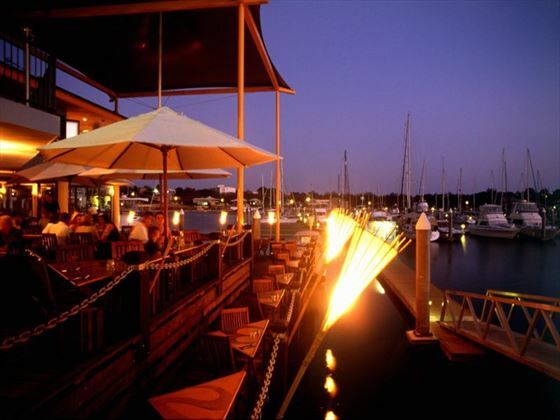 Take a guided tour and try the famous Ord River Rum Cake for morning tea. 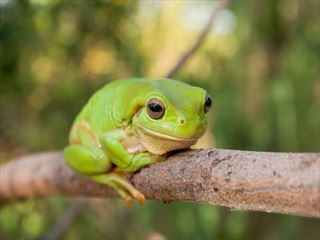 Weather permitting, take a trip to the Parry Lagoon Nature Reserve to see the birdlife before continuing on to Wyndham to the Five Rivers lookout overlooking the Cambridge Gulf. Visit the rock art murals at Warriu Park before heading along the Gibb River road to El Questro Wilderness Park. 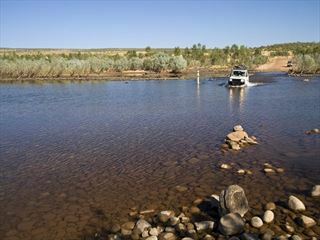 Cruise along Chamberlain Gorge in the morning then relax and lounge by the pool at Emma Gorge Resort; alternatively, hike to the gorge itself for a swim in the waterhole. In the evening sit back with a drink and enjoy the local entertainment. Visit the Argyle Diamond Mine today which produces a quarter of the world’s diamonds every year. 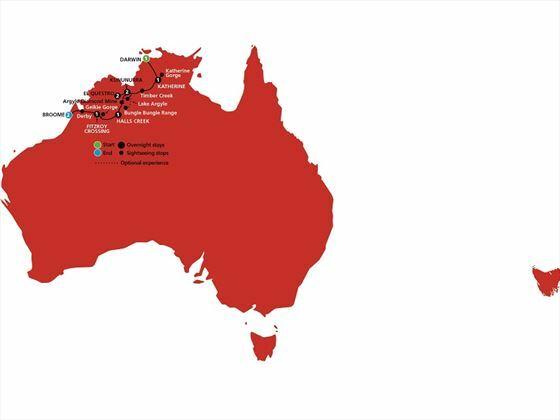 You’ll be guided by a local indigenous expert for a behind the scenes look at the mining process, before continuing on to the historic town of Halls Creek. 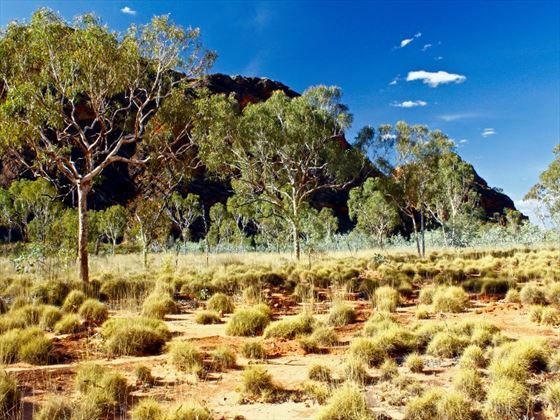 This town is located on the cusp of the Great Sandy Desert at the doorstep of the World Heritage listed Purnululu National Park. Journey to the remote township of Fitzroy Crossing, stop off at the Yiyili indigeneous community along the way to meet one of the local families at a gallery. 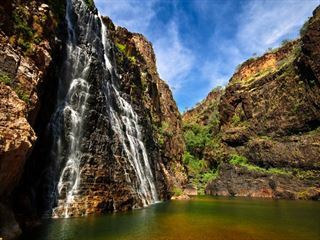 Afterwards, go for a guided afternoon cruise through the Geikie Gorge – this gorge was formed from the waters of the Fitzroy River tunnelling through the Napier Range. 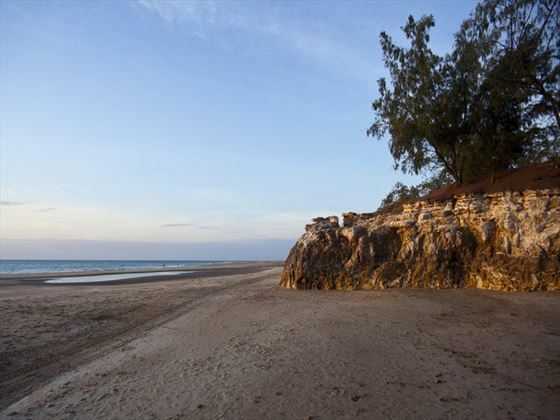 In the dry season, this river transforms into a gentle stream beneath the cliffs of the Devonian Reef; during the wet season, the river rises over 16 metres and floods the national park with seven metres of water. Be sure to keep a lookout for the freshwater crocodiles, fruit bats and wallabies in this area. Travel to the port of Derby to witness the Boab Prison Tree which was used by the first police as a holding cell. 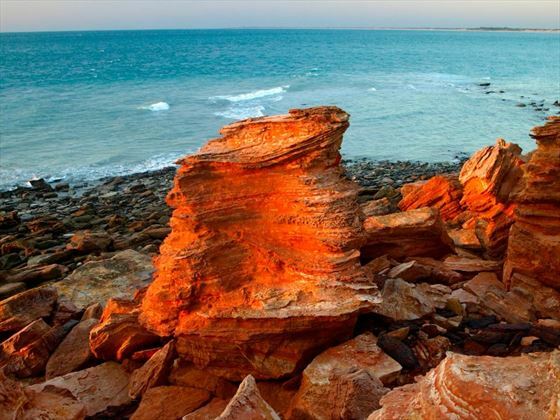 Afterwards, continue on to the resort town of Broome where you’ll enjoy a tour of the city with your guide, taking in the sights and have some free time to relax and unwind or take a camel ride along the beach, if you would prefer. 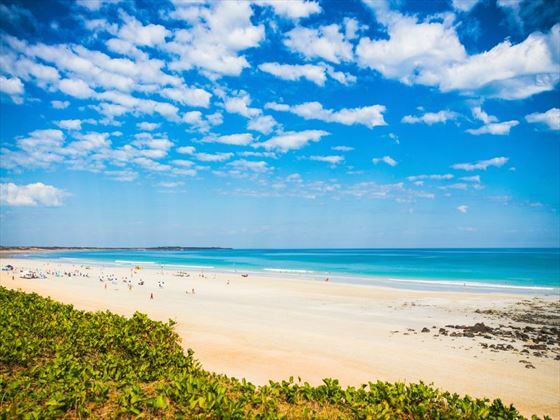 Spend the day at leisure to explore the tropical hideaway of Broome, with a leisurely stroll along the beach or a wander through bustling Chinatown. In the evening, join your tour guide and group for a farewell dinner at the resort. Today marks the end of the trip – you will be transferred to the airport for your departing flight. Please note - International flights and domestic flights throughout Australia are not included in the price shown.